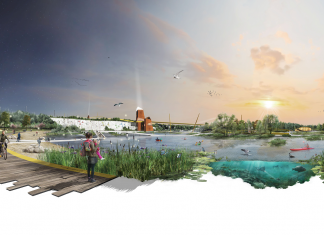 The winners of this year’s LI Student Travel Award have been announced, with the theme of ‘landscape transformation’ prompting some original and emotive responses. Lisa Peachey (MA Professional Landscape Architecture, University of East London) is the recipient of this year’s International Award, which will see her travel to Seattle to study the role of nature in psychological healing. Set to undertake a creative residency at the Bloedel Reserve, a site renowned for the restorative qualities of its Reflection Garden and ‘Strolls for Wellbeing’ programme, Lisa will use the opportunity to explore the transformative qualities of nature in dealing with grief. To commemorate the Landscape Institute’s 90th birthday, for the first time, a UK award was introduced to the competition, enabling two deserving students to conduct research in a domestic setting. Emma will visit Greenwich Millennium Village to study the impact of socially responsive urban design, and how the sculpting of spatial volumes can influence the way people behave and interact with each other. Rebecca will study the dramatic transformation of a public space over a 24-hour period, as she participates in a sit-in protest in central London, which will see Parliament Square transformed into a communal living area.